WASHINGTON, DC -- A senior official in Ukraine's ruling coalition is criticizing the country's president for a deal to extend the stay of Russia's Black Sea Fleet at a Ukrainian ports. Serhey Tihypko, prime minister for economic issues, said in an interview with The Associated Press that while the deal might make economic sense, President Viktor Yanukovych should have been more open about the negotiations. "The procedure of debating the agreement and completing it behind closed doors is not what the Ukrainian people want," Tihypko said through an interpreter. Tihypko joined the coalition after finishing third during the first round of the presidential contest in January. Yanukovych signed the deal Wednesday with Russian President Dmitry Medvedev to extend the Russian lease at the port of Sevastopol after the existing lease expires in 2017. Yanukovych's predecessor, Viktor Yuschenko, had threatened to end Russia's lease on the strategically important base. The deal signals that Yanukovych is looking for closer co-operation with Russia. But Tihypko said that good relations with Russia will not cause a turning away from the West. He said that European integration remained the country's number one foreign policy priority. He praised the base deal on economic terms. Tihypko said that under the agreement, Ukraine will receive large discounts on gas shipments in return for extending the lease, which will ease the country's budget woes. "From the economic point of view, the latest agreement on the base is a good one," he said. Ukraine has been hit by the global downturn harder than many other European countries. The country was granted a $16.4 billion bailout loan by the IMF last year. In October, the fund halted the fourth and final portion of the loan, worth $3.8 billion, demanding that the country's leadership resolve its budget crisis. Ukraine negotiated the payout of $2 billion in December, but $1.8 billion remains frozen. Tihypko was in Washington attending meetings of the IMF and World Bank. He was expected to meet with IMF Managing Director Dominique Strauss-Kahn Monday. 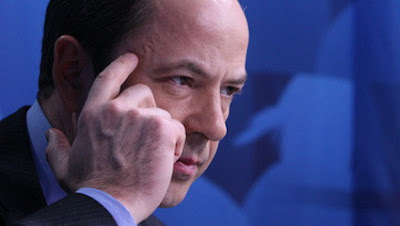 Tihypko said that he believe his country could complete a new agreement with the IMF by June.